Shimla Spa Holidays is a much cherished vacation inspired by the refreshing crispiness of Himalayan surroundings. That same crispiness is present in the spa experience here. Spread over a week, this journey to the British Summer Capital is a joyride filled with numerous vintage experiences, including a toy train ride, four day special spa sessions and a rich sightseeing of the hill station’s gems. All this and much more are a part of healing Shimla Spa Holidays. Upon arrival in Delhi, meet Incredible India Tour representative for assisted transfer to the hotel for overnight stay. Rest of the day is free at leisure. Early morning, check-out and transfer to Railway Station and board the connecting train # 2011 Kalka Shatabdi Express (07:40 hrs -12:00 hrs). From there, board the toy train, Himalayan Queen. (12:10 hrs/ 17:20 hrs) This will be one of the enchanting and quintessential journeys of life passing through arched bridges, 103 tunnels and thickly forested greens spread between throughout the mountainous stretch from Kalka to Shimla. Upon reaching Shimla, check in the Oberoi Wildflower Hall, an iconic spa resort in the valley. Overnight in Shimla. 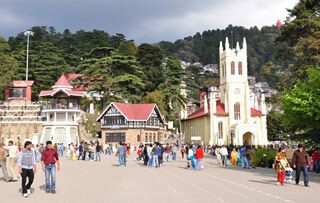 Shimla was the summer capital of the British. Its cool calm environs used to heal the people of their stress and tensions. The same facet continues now with the spa holiday extension to the hill station tour. The next four days are free for a visitor to undergo the gentle and pampering spa therapies to relax, rejuvenate and inspire the soul with its healing benefits. The crisp signature spa rituals, revitalizing body therapies along with yoga and gym sessions contribute to the wellness of the visitor. Post afternoon spa session, the visitors are free to experience the beauty and enigmatic appeal of the crisp Himalayas. Overnight in Shimla. After the healthy boost to the well-being during the Shimla Spa Holidays and a leisurely morning and lunch, check out the Wildflower resort and begin a drive towards Kalka Railway Station (about 2 ½ hrs) where visitors will board the 2012 Kalka Shatabdi Express. (17:30 hrs/ New Delhi at 21:40 hrs). Later transfer to international airport to connect flight for onward destination.